Aspiring Adults Adrift: Tentative Transitions of College Graduates by Richard Arum and Josipa Roksa is a follow up to their landmark Academically Adrift that made the case for how many college students end up learning very little, end up unemployed or under employed, and living at home. Now they follow this same college cohort two years after graduation and see that many found a difficult transition to adulthood. Together these works should challenge students and colleges to rethink the aims, approaches, and achievements of higher education. Click here to read my summary of Academically Adrift. Richard is a professor in the Department of Sociology with a joint appointment in the Steinhardt School of Education at New York University. 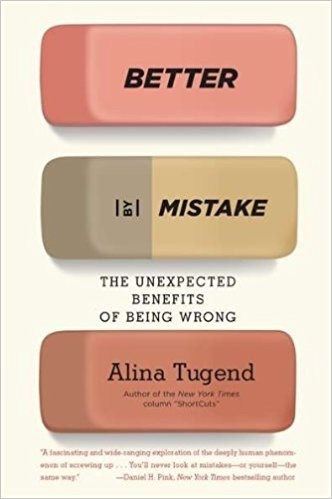 He is a senior fellow at the Bill & Melinda Gates Foundation and the author of Judging School Discipline: The Crisis of Moral Authority in American Schools. Josipa Roksa is associate professor of sociology and education and associate director of the Center for Advanced Study of Teaching and Learning in Higher Education at the University of Virginia. 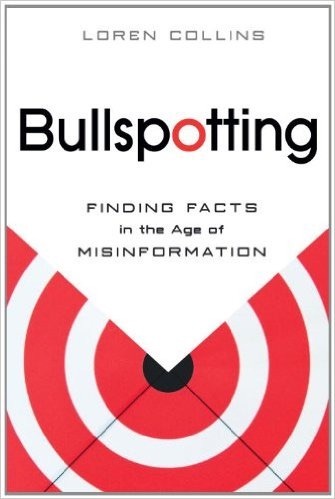 This book is based on research that tracks more than 1,600 students (emerging adults) through their senior year at twenty-five diverse four-year colleges and universities, and approximately 1,000 college graduates from this sample for two years following their graduation in 2009. They also did in-depth interviews with a subset of 80 graduates in 2011 in order to find how post-college outcomes were associated with collegiate experiences and academic performance. Like their previous study, they used the Collegiate Learning Assessment (CLA) to measure critical thinking, complex reasoning, and written communication around the time of their graduation. 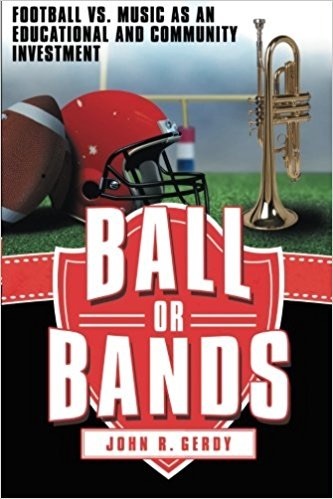 Ball or Bands: Football vs Music as an Educational and Community Investment by John Gerdy (©2014) uses research to support the notion that due to costs, injuries, its focus on elite male athletes, and a negative impact on school cultures, support for high school football can no longer be defended. He also makes a case for why music and the arts in general need more support. He comes at this topic as a musician and an athlete with a brief career in the NBA. Click at the bottom of any page to get copies for your board of education members, and be strong if you take on king football. John is founder and executive director of Music for Everyone. A former all-American and professional basketball player, he served at the NCAA and as associate commissioner of the Southeastern Conference. He is author of Sports: The All-American Addiction and Air Ball: American Education’s Failed Experiment with Elite Athletics. The first two chapters outline John’s background experiences in athletics and music. While his father was a physics teacher, he was also the head football coach. Much to his father’s disappointment, John chose basketball and went on to become the leading career scorer at Davidson College followed by a brief professional career. He then went on to get a PhD and work several jobs as a sports administrator. His music life started in eight grade where he quit the school chorus because the director wouldn’t do any Beatles songs (1971). In high school he picked up the guitar, and over time gradually learned percussion and saxophone. As he moved around, he looked for opportunities to play in pick up bands and perform in clubs. When his kids started school he volunteered to perform and teach, and even went so far as to develop a seven-week blues curriculum, which culminates in an assembly where children sing and play percussion to a blues song that they have written. John sees little difference between open mic and pick up basketball or other team sports. Each group is striving toward a common goal, which is to figure out where everyone’s talents can contribute. 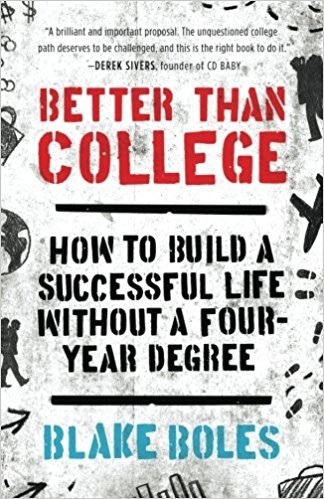 Better Than College: How to Build a Better Life Without a Four-Year Degree by Blake Boles (Copyright © 2012 by Blake Boles) offers the thesis that you can skip four-year college and still get a higher education. This may seem nuts, but spend a few moments considering the propositions, and you’ll begin to see why Zero Tuition College (ZTC) holds just as much life-changing potential as traditional college. Please click on the icon at the bottom of any page to purchase this outstanding book. After two years as an astrophysics major at US Berkley, Blake convinced the school to let him design his own alternative education major. Two years later, he realized that he didn’t need school at all to do what he had just accomplished. Unfortunately, not every college would allow him to do what he did. 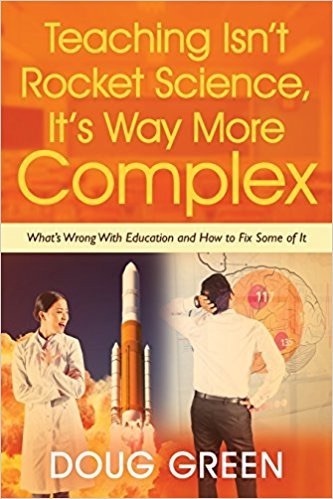 He has since met many young adults who did everything that he did—learning deeply, developing mastery, becoming exposed to new fields, adventuring, building work experience, and following their passions—without the college price tag.. When the price of oil rises, we look more seriously at alternative energy. When a business raises its prices, we consider different ways that we could obtain the same goods or services. But even though the price of college has skyrocketed, we still flood its gates. Why? A college degree proves that you can survive four years. It’s a piece of paper that says, I followed a prescribed path. A higher education, though, is first and foremost the capacity to self-direct your life. Someone who has a higher education can define her own vision of success and pursue it, even in the face of difficulty. A college degree does not guarantee a higher education. Instead of following someone else’s curriculum, self-directed learners begin by asking themselves what fascinates and drives them. Their journey begins—and ends—with self-knowledge. Instead of taking full-time classes, self-directed learners give themselves assignments that they find interesting, eye-opening, and challenging. They start businesses, find internships, travel the world, read and write about things that fascinate them, and work for organizations they admire. Instead of working on homework, papers, and presentations destined to be seen once and tossed into a trash can, self-directed learners turn much of their hard work into useful products for other people. 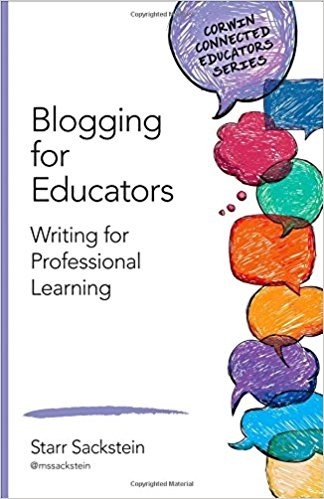 Blogging for Educators: Writing for Professional Learning by Starr Sackstein provides a strong rational for why educators should blog along with advice on how to get started. She is one of the best education bloggers I have found to date, and I explore the educational blogosphere every day. Be sure to click the icon at the bottom of any page to get copies for teachers you know. Starr is a high school English and Journalism teacher at World Journalism Preparatory School in Flushing, NY. She is also the author of Teaching Mythology Exposed: Helping Teachers Create Visionary Classroom Perspective. She does a blog for Education Week called Work in Progress in addition to her personal blog at StarrSackstein.Com where she discusses all aspects of being a teacher. She moderates #jerdchat and #sunchat and contributes to #NYedChat. If you are looking for an energetic, high quality speaker on the subjects of blogging, journalism education, and bring your own device (BYOD), contact her at twitter (@mssackstein) or FaceBook. Starr sees blogging as an important tool for educations leaders and students. Blogging adds virtual connections to writing, which is a vital part of communication. Sharing reflections and ideas with an audience can certainly richen one’s educational experience. Few educators, however, have been formally prepared with the necessary skills for teacher blogging, which is the main purpose of this book. 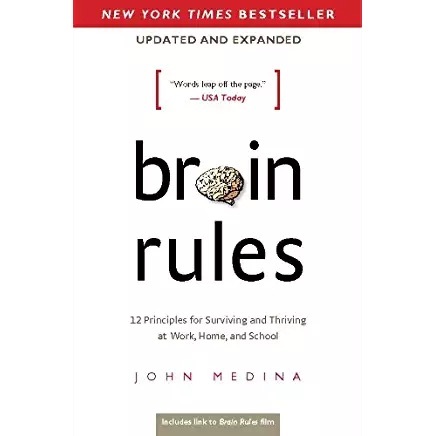 This book should make it easier for you to help students reflect, develop metacognitive skills, foster an authentic voice, and develop a deeper understanding of their strengths and challenges. Starr starts by pointing out that blogs are the natural evolution of diaries and journals. Anyone in the habit of daily entries is certainly a natural for blogging. The difference of course is that blogs by their nature are public. They generally also allow for comments, so they can be much more collaborative than their predecessors. To buy Starr’s argument you need to share her vision that regular blogging will enhance your writing and thinking ability as you gain stamina and an outlet for your creativity. It will also make you more accountable to your audience and allow opportunities for greater reflection. Like myself, Starr had help from someone who knew more about the technicalities of setting up a blog, so don’t feel bad if you do too. Most districts should have tech support to help you get thinks going. Perhaps an easier place to start is with a Twitter account. With a 140 character limit, Twitter is considered a microblog. Once you start you can follow your favorite news outlets, which can save you time. Also try to find educators with common interests to connect with. (Each day I post the Twitter names of top bloggers.) Look for opportunities to engage in Twitter chats. My favorite is #edchat. In addition to tweeting out your thoughts and opinions, you can seek help for others. The purpose for blogging in a teaching context is to expand your personal learning community (PLN). Make sure your tweets and posts avoid going off on a tirade, and back up your opinions. While it is easy to tweet every day, extended blog posts might be something you post less often. Keep in mind that once you start, students and parents will naturally find and follow you, so you might as well use your blog to connect them to what happens in your classroom and school. At the end of this chapter there are links and advice from other teachers who blog. Like all chapters, it also ends with reflection questions that you can consider yourself and discuss with others.